A house located in an attractive place giving you different opportunities – see what we are offering. 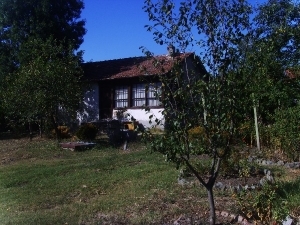 PROPERTY DESCRIPTION: Our offer is a house located at the center of this attractive village facing on an asphalt road. The property is one-storey old house and needs renovation. With the help of our team of professional builders it can be turned into lovely cozy home for you. The work of our builders you can see on our website on Renovation work. The house has 80 sq. m of living area and comprises an entrance hall and three rooms. GARDEN: The yard is 1103 sq. m flat, rectangular. The central location of the property gives you the opportunity for business development like a shop, a cafй, a restaurant, a car wash and etc.